Last week on the Kore Studios blog we looked at the anatomy and acoustics of the bass drum, offering our tips on achieving a more consistent and robust sound. Now, we’ll be expanding beyond this low-end sound into higher frequencies, leaving the earthy thump of the bass drum and venturing into the kaleidoscopic tones of the guitar. We’ll be sharing some of our tips for making the most out of your guitar tone and achieving a sound that does your playing justice. We know what you might be thinking: guitars are so versatile and broad, carrying limitless potential in terms of sounds and effects, with thousands upon thousands of models to choose from – how could WE possibly tell YOU how to make your guitar sound better when there is clearly no “right or wrong” sound? Is there even such thing as a “right or wrong” sound? And you’d be right! At the end of the day, your guitar should sound just as you want it to sound, whether that’s crunchy and abrasive, smooth and dreamy, or light and twangy. Needless to say, restricting any instrument to just one “correct” sound is against the whole point of making music, hampering your sense of expression and experimentation. However, what we are saying is that there are certain ways of improving the quality of your guitar tone, regardless of sound or style. It’s easy to get stuck in a rut with your tone and settle on a low-quality sound – sounds that just wouldn’t cut it in a professional studio – due to your equipment, your set-up, and other factors. The guitar is a magnificent instrument, offering musicians plenty of room for expression and a near-infinite array of sounds – but making the most of this potential is only possible if you have the right tips and tricks. So without further ado, here are some quick tips to help you crank your guitar tone up to eleven! When it comes to your pickups, there are many adjustments you can make that have an effect on the tone and character of your guitar. Of course, achieving the perfect guitar tonal quality often involves changing the pickups altogether – something that requires you to shop around, experiment with different pickups, not to mention put aside a bit of cash. But we’re talking about changes you can make to your tone right now, and there are some ways of adjusting your current pickups, tweak your guitar’s output levels, and tighten up your sound. Namely, adjusting the height of your pickups can make the difference between a crunchier tone with a more pronounced high-end and a cleaner tone with less sustain and more bass. All you need is a screwdriver and a working pair of ears (and maybe a ruler). Making changes is easy: turn the screws in the pickups one way and they raise. Turn them the other way and they drop. The preferred height for pickups differs from person to person and depends on several factors such as the guitar, the strings, the amp being used and the playing style you prefer. Be careful, because pickups too close to the strings could result in a grating sound, whereas too far from the strings will result in weak output levels. Play around with your pickup height one millimeter at a time to see if you can touch upon any fundamental improvements in your tone! A close friend of the pickup, the all-important guitar string is one of the most influential elements when it comes to perfecting your tone and exploring the sounds offered by your guitar. Sure effects pedals and amplifiers can transform your sound down the line, but strings are like the muscles of your guitar – keep them up to scratch to fundamentally improve your tone. Similar to pickups, buying a new set of strings and experimenting with different gauges, materials and windings is the most effective way of altering the essence of your guitar tone. Even if you already know what your favourite strings are, changing them regularly is a must, helping your guitar sound as fresh as it was built to sound. With plenty of practice, it will take you no more than 20 minutes to change and tune all your strings. Still, we’d recommend trying out different types of strings to see which works best for you. Stainless steel strings make a nice change from the more common nickel strings featured on most guitars, giving you more sustain with less of a “muddy” quality. Similarly, experiment with strings with different windings: flat-wound strings offer a more robust sound with added warmth, while round-wound strings have a sharper quality that complements those “twangier” tunes. It may seem like the a minor change, but changing the pick you use to play your guitar can make a noticeable difference to the sound produced by the strings. Just think about the difference in sound when plucking strings with your fingers compared to plucking them with you pick – there is a similar change in sound when you vary the shape, thickness and material of your pick. Sometimes this change in sound is due to the way in which the pick interacts with the string, and sometimes it’s due to the playing technique promoted by the pick in question. Usually, thicker picks with more mass will result in increased volume, most suitable for strummed songs, while thinner picks have a sharper attack, perhaps better suited to a smoother playing styles and increased articulation. In like fashion, a rounded tip will be softer on the attack while pointed tips will be brighter. And finally, picks come in a number of materials, with plastics being the most common for casual players. It’s worth venturing to your local guitar shop and sampling picks of different materials and adding a mixed bag of them to your collection – you might find that picks of a certain material are better suited to certain songs. Thrash metal, quite naturally, would be befitting of a heavy-duty steel pick that offers a crisp abrasiveness. Nylon picks are noted for their lighter sound, making them appropriate for smooth soloing. And it seems only right to strum along to country ditties using a wooden pick! Ultimately, as with any creative activity, the choice is yours. Kore Studios is a recording studio in West London run by experienced producer/engineer, George Apsion. We offer a large live space and two control rooms, backed up by a mixture of high-end and vintage gear, brought together by experts in producing and mixing various different styles of music. Get in touch to arrange your tailored studio session. ... to the Kore Studios blog! Here you will find a whole host of links and articles that relate to the daily goings on at our West London recording studio, covering everything from music engineering and production to live tracking and mixing. As a dedicated music production blog, we also hope to dish out some expert advice on everything to do with equipment, technique, recording, and the industry as a whole. We update our blog regularly, so be sure to keep your eyes on this space! 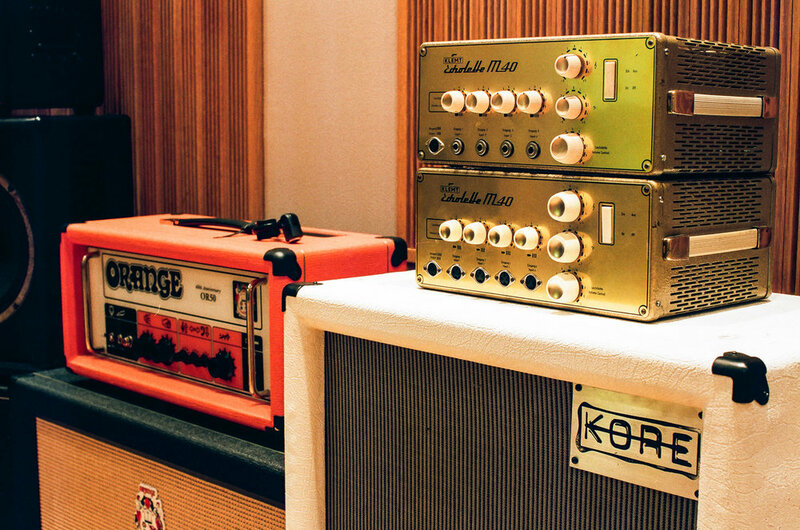 Kore is a recording studio in London. We are located in Acton, West London and offer a large live space featuring two booths, along with an API 1608 console, Pro Tools HDX setup, and a great collection of vintage mics. Please get in touch to book your studio session now.